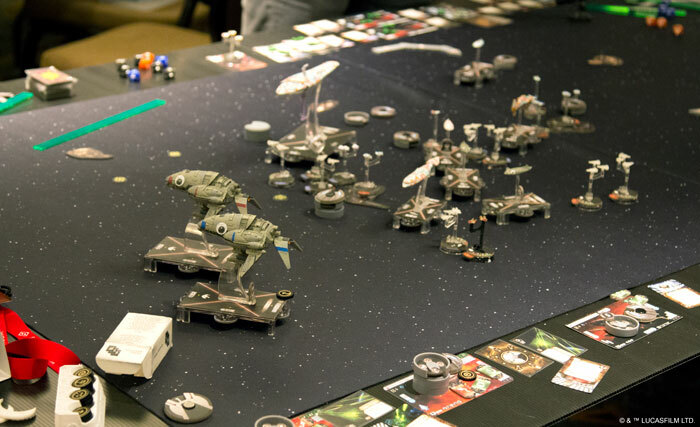 As we head toward the 2019 Star Wars™: Armada World Championships at AdeptiCon, we find the game’s competitive environment in an interesting place. The construction of the Empire’s forthcoming Super Star Destroyer remains ongoing, and the ship won’t arrive in time for the 2019 World Championship. Even so, it’s hard to say which fleets will conquer the coming World Championship. Wave VII was so new at the 2018 World Championship that players may not have fully had time last year to explore its impact, while the game’s dual focus on objectives and ship-to-ship combat promotes the rise and fall of prominent lists as players learn to counter them… and then to counter the counters. We presented these thoughts—and more—to 2018 World Champion Nathan Coda as we looked ahead to the 2019 World Championship tournament coming this March 28–29 in Schaumburg, Illinois. And we found Nathan just as excited as ever to prepare for the tournament—and the chance to reunite with the game’s most enthusiastic players. Fantasy Flight Games (FFG): Hi, Nathan, thanks for taking the time to talk with me today. Nathan Coda (NC): Sure thing! Always happy to make time for Armada talk. 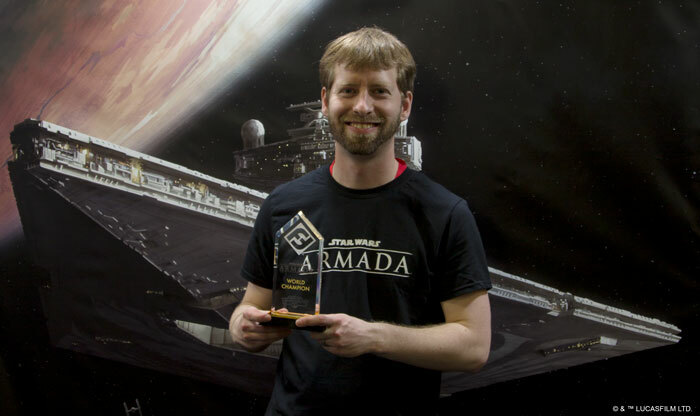 FFG: You’ll soon be headed to AdeptiCon as last year’s Star Wars: Armada World Champion. Are you excited about what you’ll face? NC: For sure! I love playing. Armada has a great community, and it’s always a pleasure to get games in with other people. Worlds is especially exciting because I generally get to play against a lot of new faces. 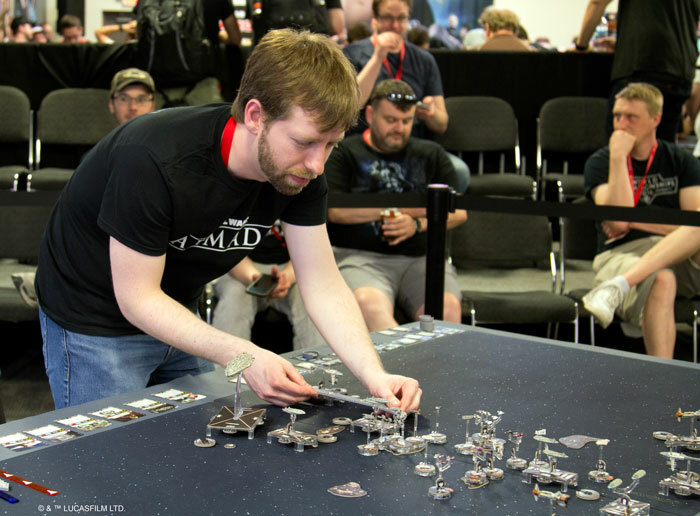 FFG: I’ve noticed that the players at the Star Wars: Armada World Championship have typically looked like a really close-knit group, getting dinners together and spending a lot of time together outside of the game. Do you think this has anything to do with how committed you have to be to the game to sit down (or stand up) and play for ten or twelve hours at a time during a tournament? NC: I think that’s fair to say. You have to be pretty passionate to something to make that kind of investment of time and energy. And when you run into a bunch of people just as passionate as you are… Well, we all just want to spend time together. FFG: Are there any rivalries among the players? I know the Canadians attend in pretty large numbers and took the 2017 World Championship before you reclaimed it for the U.S. last year. FFG: Let’s back up for a moment. How did you first get into Star Wars: Armada? NC: I started with X-Wing™, like I feel many Armada players did. I’ve always loved the big space battles in Star Wars, so when I saw FFG coming out with a plastic miniatures version, I was thrilled. I played a few games with the Core Set, and just couldn’t put it down after that. FFG: What is it that draws you to Armada? What does Armada offer you that sets it apart from other games? NC: I think my favorite parts of Armada are the complexity and interactions that are available. The things that really drew me in from X-Wing were how the mechanics for defense switched from dice to tokens and the way that ships maneuver with real momentum. Ships in Armada just have more of a feeling of movement and impact. FFG: Given how much your ships carry their momentum forward from round to round, do you approach a game with an idea of how you’ll move through all six rounds? Or how much of your plan is fluid? NC: I’ll generally start with a pretty loose plan. I try to leave the maximum number of options open as the fleets move toward engagement, and I try to limit my opponent’s options. The best position you can be in is when your opponent is only able to choose between a few bad choices. But you have to come into a game with some sort of plan. FFG: Since you’re making those plans several turns or more in advance, do you ever find yourself realizing that you’ve already won or lost a game two, three, or more rounds before you get to the end? NC: For sure! Games of Armada generally build toward one or two critical activations. After that activation, you can generally tell if the game is going to go your way or not. For example, is that Imperial-class Star Destroyer still limping toward your carrier, or did your B-wings manage to finish it off before it could activate? Not every game goes this way. Some games do go down to the wire. But they often turn on a single critical activation. After that moment, one player is trying to salvage points and the other is trying to maximize theirs. Two fleets move to engage during the 2018 World Championship Finals. FFG: Ah, that was my next question: what do you do after that turning point? Just focus on playing for tournament points? NC: Yes, what often defines an actual winner of a tournament is how much they can maximize their wins and minimize their losses—in regards to tournament points. FFG: How do you go about minimizing your losses? NC: Often you want to disengage or limit opportunities for your opponent to fire on your ships. It might be only turn three, and you need to decide if you are going to turn your flagship in to engage or turn out to disengage. FFG: And try to snag some victory points from the objective? NC: If you can. Or pick off some squadrons, or whatever enemy ship may be limping along in range. FFG: I was going to ask if you’ve recognized certain traits that separate the elite players from more casual players. Are these the defining decisions? How to react when the game tilts toward victory in one way or the other? NC: I think that does come into play. I think there are generally more subtle differences as well, especially in positioning. More experienced players know how all the ships fly, know where your ships can go, and react not to where you currently are, but to where you are going to be. FFG: How can you tell, then, if a player is less familiar with his or her ships? Are there any tells from the initial placement or maneuvers? NC: Sure, a few—but I don’t want anyone to feel judged if they are doing these. In initial deployment, if you’re limiting your activation order by placing ships in a way that they must activate in a certain order without collisions, that’s generally a bad option. Your opponent is already trying to limit your options, so you don’t want to limit your own. If you are activating ships in a non-optimal order, that’s generally a bad idea. For instance, activating a ship to fly into range of my ships before they activate when you don’t have to. FFG: Right—because you want them to fly into your firing range before you fly into theirs… An extra round of free shots. NC: Exactly. More experienced players are much more aware of threat ranges and engagement ranges as they approach. A pair of modified Assault Frigates seen in action during the 2018 World Championships. FFG: Going a step further, when you’re playing against other top players, how do you determine what your opponent’s strategy is? And what are you able to do to counter it? How much of that strategy is revealed in the list? How much in the placement? And how much in the opening maneuvers? NC: That’s going to depend on a variety of factors. When you look at a list, you can generally guess what their goal is, and objective selection and initial deployments reveal a lot. It’s a bunch of different levels of strategic decisions at that point—point and counter-point about how the game is going to be approached. FFG: So let’s talk about how this type of strategy has been manifesting in the metagame since last year’s World Championship. When you won last year, Wave VII was relatively new, and while we’ve announced the upcoming release of the Super Star Destroyer, it won’t be available until after the World Championship. That means we’ll have had about a year to see the metagame evolve with the same components. was last year, how much have we seen lists developed to counter him? And then to counter the counters? NC: It’s been really interesting to see what has been happening in the meta over the last year, even without any new releases. Things keep changing. Honestly, I’m still confused about where Rieekan Aces went. I think it’s still a very strong contender in the current meta. It really hasn’t been showing up much lately. There are hardly any results for it in this year’s Regional Championships. FFG: What have you seen taking its place? NC: I think one of the more prominent lists to take its place is Imperial two-ship, which takes advantage of how the activation game is played in a really interesting way. has still been smashing things up in interesting and unique ways. 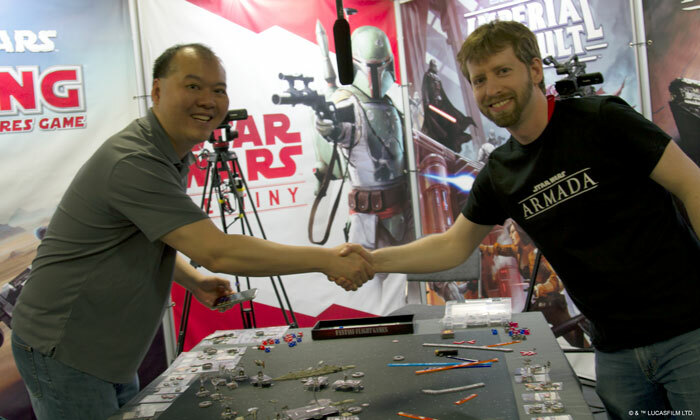 Nathan Coda shakes hands with 2018 Star Wars: Armada Finalist Shiu-Yik Au. FFG: Care to explain how the Imperial two-ship plays the activation game in an interesting way? NC: In Armada, activations are king. It’s especially powerful to play the game as first player and have more activations. was released in Wave VII and turns this dynamic on its head by allowing a player with fewer activations to still go last and then first. FFG: So she can force your opponent to come into range of your biggest guns, allow you to shoot once at the end of the round, and then shoot again at the beginning of the next round? FFG: And this allows you to be first player with the same one-two punch—but with bigger ships? NC: Exactly. Pryce goes on a high-impact ship, so even if you are getting swarmed, you can still punch in hard, twice in a row. At that point, your opponent is often too crippled to continue the fight. FFG: Has this resulted in fiercer bidding wars for first player? Are people actively looking to see how much they can strip out of their lists in order to get that first player activation? Or what sort of changes have you seen, even while the available ships, squadrons, and cards have remained the same? NC: This can play out as a bit of a bidding war, for sure. But even without Wave VII, bidding wars were still a major thing. FFG: Have you seen anyone go as low as 350? NC: Never personally. I generally see around 375 as a minimum. Though I’ve heard of bids as low as 360. FFG: Your personal experience reminds me: I wanted to ask about your local play group. Who are these players who helped you refine your game well enough to win the World Championship? Is yours a pretty competitive play group? Or are you the most competitive of them by a stretch? NC: I’ve been fortunate enough to live in two different places in the last few years—Minneapolis and Chicago—that both had awesome groups of people. There’s definitely players in both those groups that are as or more competitive than me, and it’s been a pleasure to be a part of both of those communities. FFG: With that competition, do you play Rieekan in your local games? Or do you have another fleet you prefer to play for more casual games? NC: Rieekan is my favorite Admiral (surprising no one), though I generally only pull out my Worlds list for major tournaments. And I haven’t even played it since last spring. Casually, I like to experiment with and try new things. There are so many different interactions in the game and ships that fly and feel so different, it’s exciting seeing how they work out. And since everyone flies differently, experiences with ships vary. Watch the full 2018 Star Wars: Armada World Championship Finals match. FFG: If you knew that you could fly any list back to the World Championship finals—like if you were guaranteed to get there and could fly your favorite, most “fun” list—what would it feature? NC: Now that’s a hard question. I don’t feel like I ever sit down at a table with a list that’s not fun. , so probably something with those. Maybe it could be “fun” to take that kind of list to the finals because absolutely no one would expect it. FFG: The Mon Calamari fleet? at the top table. He’s been my go-to admiral recently. His ability is a little underwhelming and annoying to get to work right, but it has some very interesting synergies. FFG: Do you think you could fly a whole fleet from the time of Star Wars: Rebels? NC: That would be fun! I’ve played around with ideas like that before. Unfortunately, nothing terribly competitive, but they can be fun to get on the table sometimes. FFG: Sounds like you’re pretty firmly a Rebel player, though? NC: For sure. I keep wanting to play with all the Empire’s cool stuff, but I just can’t seem to leave the Rebellion. FFG: All right, before we go: I know you can’t say much at this time about your champion card, but can you—in broad strokes—tell us what sort of game interaction you targeted? NC: For sure! One thing that seems to be a constant in successful fleets is they are either bringing maximum squadron points or almost no squadron points. I’d love to see it be more feasible to build fleets with 60 to 90 points of squadrons that can hold their own. Though, at the end of the day, I really just want to work on something fun and interesting to play. So we’ll see how it turns out. FFG: All right… something with a meaningful contingent of squadrons, but below maximum squadron points. We’ll have to wait for that one! Finally, I know that you and your wife just had a new baby boy. Congratulations! What’s his name? And when he gets old enough that the Armada squadrons might be interesting game concepts rather than choking hazards, how do you plan to convince him to try a game with his dear old dad? NC: Thank you! 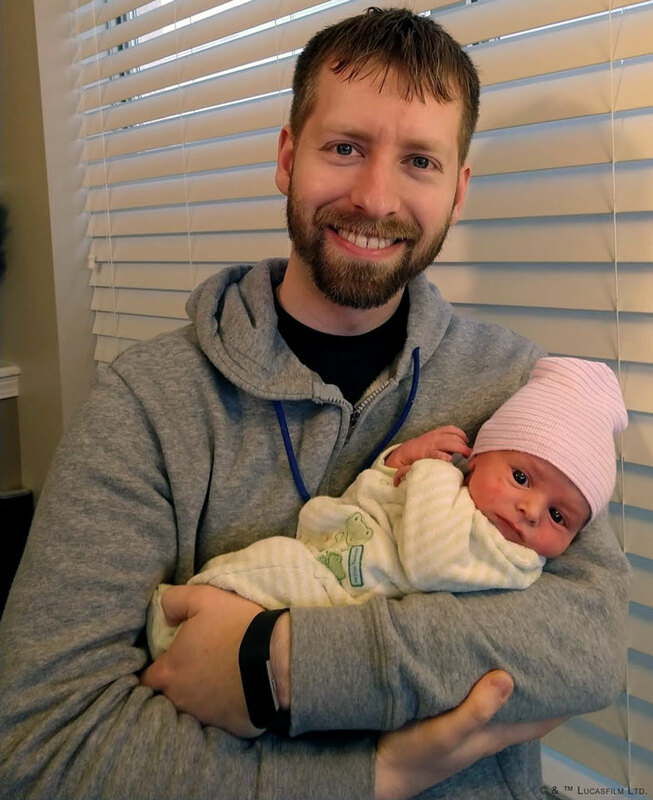 Our son is named Calvin, and I’m hoping he’ll be excited to play board games with me one day. We’ve got more than a few years to go until Armada is age appropriate, but at that point, he’ll hopefully be a big fan of Star Wars, and will be just as excited about the models and big fleet battles as I am. I fully expect he’ll be the one bugging me to play the game. FFG: Anything else you’d like to share before we go? NC: Nothing specific. Just to keep flying and having fun! FFG: Thank you, and best of health to you and your family. NC: You as well. Have a good night! 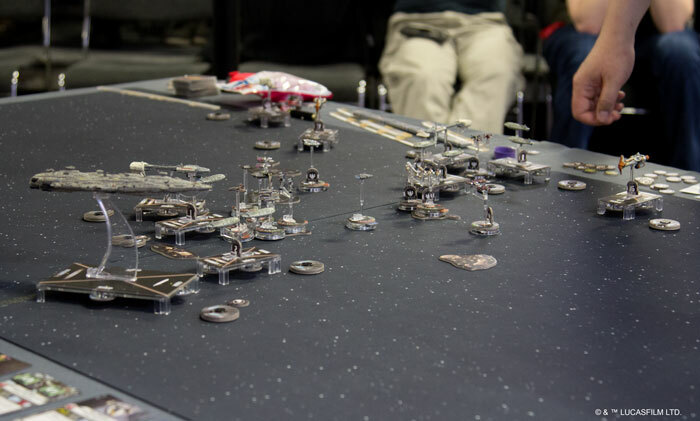 Whether or not you’re able to attend the 2019 Star Wars: Armada World Championship at AdeptiCon, the event is bound to prove an exciting time for every Armada fan—present and future. Not only will we see the game’s top players unveiling their most creative and refined strategies to compete for the game’s biggest prizes, but we’ll see the next announcement of a future Star Wars: Armada expansion. What will be announced? And how will the new materials impact the game’s activations, squadron battles, and punishing ship-to-ship combat? We won’t have to wait too long. AdeptiCon takes place March 27–31, the Armada World Championship tournament takes place March 28–29, and we’ll cover the event on our FFG Organized Play Twitter feed @FFGOP with a recap of the event’s highlights to follow!